As temperatures and oil prices rise, Augsburg's Environmental Stewardship Committee has organized eco-friendly relief this year: a campus bike-share program. The new program gives students, staff, and faculty the chance to check out a bike for personal use, free of charge. This new program is one of the steps that Augsburg is taking to become a good steward of the environment and promote energy-conscious action. By offering a free, alternative mode of transportation, the program gives everyone a chance to play a role in the College's "green" initiatives. Also, the program will allow Auggies to enjoy the outdoors and explore Minneapolis without polluting the environment. 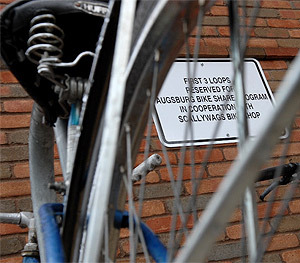 Augsburg faculty and staff donated some of the bikes for the program, but most came from Scallywag's Bike Shop. This Minneapolis shop uses a large portion of its proceeds to train and send mechanics to work alongside Rwandans who use bikes for their livelihood. Augsburg's bikes are inspected regularly and maintained by volunteers, according to sophomore Leann Vice-Reshel, who is spearheading the project. 1. Go to the Welcome Desk in Christensen Center and ask to sign up for the bike share program. You will sign a release and liability waiver and receive a year-long bike-share membership card. Note that if the bike is stolen or damaged while in your possession, you'll have to pay for repairs or replacement. 2. Take the membership card and your student ID to the main desk on the first floor of Lindell Library. 3. A library employee will give you a helmet and bike-lock key. The bike is yours to enjoy for the next 24 hours! Over 30 students, faculty, and staff have already signed up for the program. The committee hopes to expand the program this summer to provide more bikes, lists of bike stores in the area, and local trail maps. Bikes will be available for checkout in the fall, spring, and summer months. Contact Leann Vice-Reshel at viceresh@augsburg.edu if you have any questions or are interested in contributing to the bike-share program.